Burg Manager is an application to easily install Burg (along with the default Burg themes and a Burg emulator) and change most of the Burg settings such as the timeout, download and install new themes, remove Burg and restore Grub 2, set the default operating system and many advanced options. Burg Manager 1.0 has been released today, the major highlights of this release being an option to add an ISO to the BURG menu (and thus boot an ISO - however this doesn't seem to work right now -> see the comments), an option to restore BURG into MBR after a Kernel upgrade and an option to remove old kernels and its menu entries. Then you'll have to download and install BUC. And finally you'll be able to download Burg Manager 1.0 from its author blog and install it. 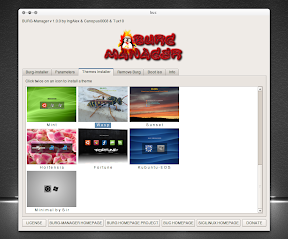 For a complete how-to on using Burg Manager, see our Install And Configure Burg In Ubuntu With Burg Manager post. Image in the beginning of the post: Dark Shine BURG theme @ Deviantart (included in BURG Manager).